The World Health Organisation has ordered seasonal influenza vaccines from Vietnam according to the Ministry of Health. Deputy Minister of Health Nguyen Thanh Long announced the news during a conference on August 28 about prospects for research and development of vaccines for Vietnam. It is expected that the vaccines will be widely used in early 2019. According to Long, Vietnam is one of 14 countries that produce vaccines for the WHO. The made-in-Vietnam three-in-one influenza vaccines cost around VND80,000 (USD3.45) to VND120,000 per shot a third of imported vaccines. Vietnam has produced several types of vaccines including measles-rubella vaccine and H5N1 vaccine. Vietnam is one of 25 countries in the world and the fourth in Asia that successfully produced the measles-rubella vaccine. In early April, the vaccine was utilised on a national scale for children over 18 months old. About 50,000 children in 19 provinces and cities have been vaccinated. Vietnam is also researching polio vaccine. "The results are very positive and we'll expand the production scale," Long said. Nine projects including a five-in-one vaccine and a diphtheria-pertussis-tetanus vaccine are being carried out in accordance to the National Vaccine Product Development Programme. 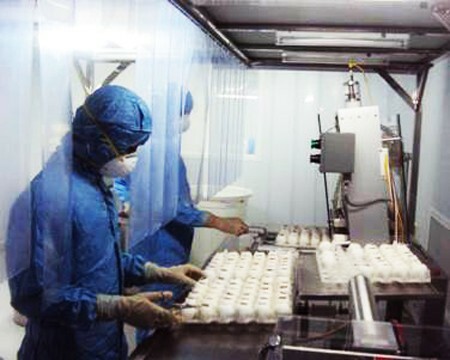 It is hoped that the five-in-one vaccine will be successfully produced in 2020 and in 2030, Vietnam will be able to produce 14 types of vaccines. In 2015, the regulatory system that ensures the safety and efficacy of vaccines produced and used was recognised by the WHO. It is also the fifth country given an export certificate from the WHO chief representative in the Western Pacific region.